Whether directly or indirectly, the federal government plays an impactful role in every state’s economy. Federal employees can make up anywhere from 1% to 10% of a state’s workforce, and a significant portion of a state’s revenue comes from the federal government. In light of the 2019 government shutdown, we decided to look at which states have more of a reliance on the federal government than others. To rank the states that depend on the federal government the most, we examined data on four factors in particular. We looked at the percent of state revenue coming from the federal government, the percent of a state’s workforce employed by the federal government, how much federal workers earn compared to private workers and the ratio of federal government funding to income taxes state residents pay. Check out our data and methodology below to see where we got our data and how we put it together to create our final ranks. Northeast scores well - With only one state in the top 10 and four states in the bottom 10, Northeastern states appear to be fairly self-reliant and not as dependent on the federal government. Connecticut is the bottom-ranked state, with Massachusetts and New Jersey coming in 47th and 46th respectively. Southern states rely on the government more - Across the top 10, there are five Southern states. In second is West Virginia, in third is Alabama, in fourth is Mississippi, in sixth is Kentucky and in 10th is Arkansas. 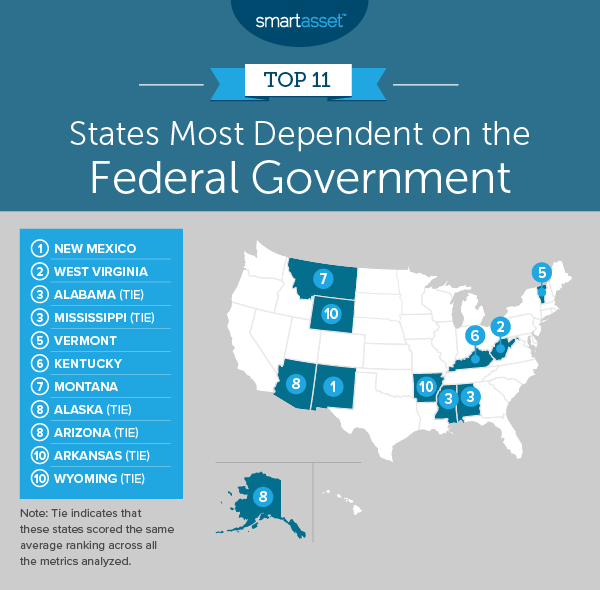 New Mexico is the state most dependent on the federal government, according to our data. This state ranks third in percent of the state budget funded by the federal government and fifth for percent of workers employed by the federal government. In fact, New Mexico ranks in the top five for every metric we analyzed. West Virginia ranked no worse than 10th in any metric we tracked. With a 2:1 ratio, the state ranked third for federal funding to the state government relative to taxes paid to the federal government. Nearly 3.6% of all workers in West Virginia receive their paycheck from the federal government as well, the seventh-highest rate. Two states tied for third. In Alabama, nearly 3% of employees work for the federal government, the 11th-highest rate in our study. But the wages these government workers earn boost Alabama’s ranking. The average federal government employee in Alabama earns nearly 2.2 times what the average private sector worker earns. Nearly 44% of Mississippi’s state government income comes from the federal government. In that metric, Mississippi ranks first. In general, Mississippi does not tend to send much back to the federal government, either. For every income tax dollar Mississippi sends to Uncle Sam, the federal government sends the Mississippi state government $2.48. According to our data, just 35% of Vermont’s general revenue comes from the federal government. That is the lowest figure in the top 10. Despite that, Vermont still takes a top-10 spot. The reason for that is the importance of federal government employees to the local economy. The average person the federal government employs earns 89% more than the average private worker. More than 41% of Kentucky’s state government’s general revenue comes from the federal government. For that metric, Kentucky ranks sixth. In addition to the significant portion of the state government funded by the federal government, Kentucky taxpayers don’t send much back to the federal government in taxes. For every dollar Kentucky residents pay in taxes, the state receives $1.49 in revenue from the federal government. Montana has a high proportion of its workforce working for the federal government. In total, nearly 3.5% of all workers in Montana work for the federal government. Just under 41% of the state government revenue comes from the federal government. In both of those metrics, Montana ranks in the top 10. Alaska has one of the highest shares of federal government workers in the country. The Census Bureau estimates nearly 7% of all workers are federal government employees. Alaska also takes in more from the federal government than its residents send back in taxes. The Census Bureau estimates that Alaska takes 14% more from the federal government than it pays in taxes. Payments from the federal government make up more than 42% of Arizona’s state revenue. In that metric, this state takes fifth. This state also ranks 15th for federal funding to the state government relative to taxes paid to the federal government. The average federal government employee makes only 72% more than the average private sector worker, a figure that ranks 26th nationwide. Arkansas takes a balanced approach to secure a top-10 spot. Across all the metrics, Arkansas ranks no worse than 27th. Arkansas only cracked the top five in the ratio of federal funding to taxes paid. Wyoming relies on the federal government more than most to make up its state budget. Census Bureau data shows that 42% of Wyoming’s state budget comes from the federal government. That is the fourth-highest score in that metric. One in about 33 employees in this state works for the federal government, another top-10 score. Wyoming would certainly rank higher if not for the low parity of pay between federal government workers and private sector workers. On average, federal government employees only earn 50% more than the average private sector worker. Federal share of state government revenue. This is the percent of the state government’s revenue that comes from the federal government. Data comes from the U.S. Census Bureau’s 2016 Annual Survey of State and Local Finances. Ratio of federal funding to income taxes paid. This is the revenue the federal government gives to the state government divided by the amount of income tax paid by the state. Data comes from the U.S. Census Bureau’s 2017 1-year American Community Survey and the IRS Individual Income and Tax Data for 2016. Percent of workers employed by the federal government. This is the percent of the overall workforce the federal government employs. Data comes from the U.S. Census Bureau’s 2017 1-year American Community Survey. Ratio of federal wage to private sector wage. This is a federal government employee’s median earnings divided by a private sector worker’s median earnings. Data comes from the U.S. Bureau’s 2017 1-year American Community Survey. To create our final score, we first ranked each state in each metric. Then we found each state’s average ranking and used this average ranking to create our final score. The state with the best average ranking received a 100. The state with the worst average ranking received a 0. Move somewhere affordable - It is fashionable to move somewhere the sun shines year-round for retirement. But apart from gravitating toward warm weather, you may also notice that retirees also tend to move to places with relatively low costs of living. In particular, Arizona and Florida stand out as landing spots for retirees. By moving to a place with a lower cost of living, you can stretch out how long your retirement fund will last you. Talk to an expert - You may not have to leave home, though, if you play your cards right. By making shrewd investments and keeping a strict budget, you can widen the potential retirement destinations available to you. In order to make sure you are on the path to financial freedom, you may want to talk to a financial advisor. Such an expert can align your investments with your retirement goals. If you are not sure where to find a financial advisor, check out SmartAsset’s financial advisor matching tool. Questions about the study? Contact us at press@smartasset.com.